The Direct Digital Imaging technology employed by DRYSTAR 5503 is not only fast, clean and environmentally friendly, it is also one of the best ways of translating the high-resolution capability of 508 ppi at a spot size of 50μm to a fi nal image. Agfa HealthCare’s Direct Digital Imaging technology performs well beyond current industry standards, ensuring that every pixel in the image is fully software controlled for virtually fl awless and consistent image quality. A signifi cant reduction in wear and tear is due to an equally signifi cant reduction in moving parts as a result of using Direct Digital Imaging technology. 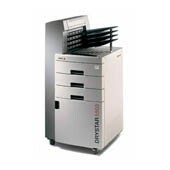 DRYSTAR 5503 features multiple-format handling, with the three most popular media sizes and/or types permanently on-line. The imager is thus capable of delivering CT, MRI, DSA, digital R&F, CR and DR images at high speed onto different DRYSTAR DT2 media. The DRYSTAR 5503 comes with three input trays. Every input tray can use fi ve different fi lm formats, ranging from 8 x 10” to 14 x 17”, making the final image versatility of this stand-alone, small footprint unit remarkable. And what DRYSTAR 5503 gains in versatility, the user gains in convenience and time. In order to increase effi ciency and user-friendliness, DRYSTAR 5503 has a unique sorter function. This ensures that whichever modality is being served, whichever print command is currently being handled, all tasks will be carried out and sorted, according to modality or patient record, if available. With DRYSTAR 5503, high traffic density input no longer means bottlenecks and slow-speed output at the imager, virtually eliminating log jams. 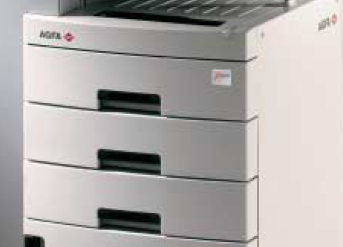 Includes Agfa's DICOM 3.0 PMS Package with up to 6 DICOM Connections - when done at installation.